Alexander Gray Associates presented an exhibition of the conceptually parallel artistic practices of Gallery artists from diverse geographical and cultural contexts, featuring recent and historical works by Polly Apfelbaum, Frank Bowling, Luis Camnitzer, Melvin Edwards, Lorraine O’Grady, Kay Rosen, and HassanSharif. For over five decades, Frank Bowling’s painting practice has been defined by an integration of autobiography and postcolonial geopolitics into abstract compositions. Parting SSTOO (2016) recalls the artist’s earlier Poured Paintings from the 1970s, harnessing the expressive potential of drips and pours to communicate a visual experience of gestural immediacy. The work belongs to a series of paintings the artist created from printed canvases gifted to him by Arlington Withers, a fellow artist and friend. Incorporating strips of Withers’ work into his own piece, Bowling fuses the abstract with the the collaborative as part of his ongoing investigation into the nature and possibilities of painting. Luis Camnitzer’s diverse practice uses language as a medium to explores such subjects as repression under systems of power, pedagogical norms, and the deconstruction of familiar frameworks. In Timelanguage (2016), Camnitzer harnesses the potential of language to construct images. A portfolio of Xerox prints, the work spells out the made-up word “Timelanguage” one letter at a time. Printed on a gradient from a light gray to black so that the first print is the lightest and the last is the most pigmented, the sequence uses visual markers of accumulation and addition to signify the passage of time and information. Lorraine O’Grady’s practice spans a variety of mediums and explores the cultural construction of identity. In Miscegenated Family Album (1980/1994), O’Grady attempts to resolve her troubled relationship with her deceased sister Devonia by inserting their story into that of Nefertiti and her younger sister Mutnedjmet. Through a series of photographs, O’Grady builds on the remarkable physical resemblance between Nefertiti and her sister to create a “novel in space” on motherhood, husbands, and aging. Drawing parallels between Ancient Egypt and the United States, the photographs presents both families as products of nearly identical historical forces. 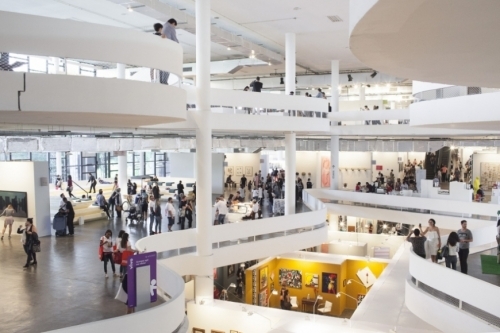 Created in 2005, SP-Arte – São Paulo International Art Festival – is a global art event that brings together renowned art and design galleries representing more than 2,000 artists in the historical Oscar Niemeyer Bienal Pavilion. During the event, local museums and cultural institutions host a strong parallel program that includes panel discussions, exhibition openings, and special visits that offer an overview of the contemporary art circuit. SP-Arte is an essential component of the latinamerican art landscape, and is positioned as a rallying point of the arts, that also strengthens and supports the country’s creative economy.